All skips can be filled to the top of the container 'Fill Level'. 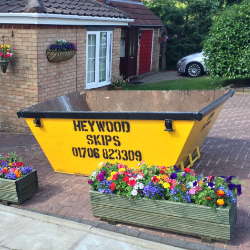 Each skip is clearly marked to show how much waste can be placed within it. Overloaded skips will not be removed. Can I put different types of waste into my skip? Yes, all different types of waste can be placed into the same skip. Once your skip arrives at the waste recycling centre it is tipped into a processing yard. The waste will be segregated in order for it to be process and recycled. What materials cannot be placed into our skips? There are a number of items/ materials that cannot be placed in our skips. Can I Burn my rubbish in your skip? No there are to be no fires in our Skips. Not only does this damage the steel structure of the skip it's very environmentally damaging. Can I place my skip on a public road? You can put your skip on a public road, however you are required to possess a council permit issued by your council and these costs do vary. 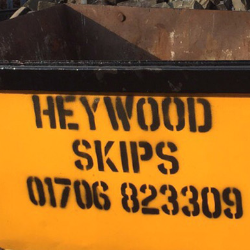 Heywood skip hire will apply for a permit on your behalf and the cost is charged at the council rate. How long can we keep a skip? Approximately two weeks. Although flexible terms can be pre-arranged.